There was some good, but overall, we got eye-raising performance from quarterback Jimmy Garoppolo. His blushes were spared when a defensive holding called negated a terrible interception, but perhaps more worrying was his tendency to hold onto the ball and invite pressure, which was a recurring theme all game long. Discarded by others, but good fits for this Kyle Shanahan offense: Mike Person and Laken Tomlinson were keys in the run game, with both men able to reach defenders to open up big running lanes for their backs. DeForest Buckner had a field day with the Lions’ offensive line, particularly rookie guard Frank Ragnow. On a few occasions, he won immediately on his first move as a pass-rusher and was completely around the blocker by the time Matthew Stafford got to the top of his dropback. Ahkello Witherspoon probably had one of his worst games as a pro thus far. He gave up a couple of scores and several catches overall, while also missing a tackle after the catch. In terms of accuracy, it wasn’t Matthew Stafford‘s best game. He missed on several throws, including a couple of deep passes where his receivers had two or more steps on the coverage defender. If those passes had been completed, it would have completely changed the makeup of the game. Detroit may have finished with 27 points, but overall it felt like the offense was having a hard time sustaining. Given that the offensive system largely remains the same as previous years, it’s clear that they are not firing on all cylinders. While he generated some pressure on some well-timed blitzes, this wasn’t a game to remember for linebacker Jarrad Davis, who recorded a couple of missed tackles as the result of bad angles taken in the run game. The Lions needed someone, anyone, on the defensive line to step up, but when you look at who is on the roster, there’s not much to be happy about. They made it far too easy for the 49ers’ offensive line to open up running lanes, and this has the makings of a season-long theme if nobody takes their game to another level. San Francisco: They won up front, and their offensive line created enough space for Matt Breida, in particular, to run wild. 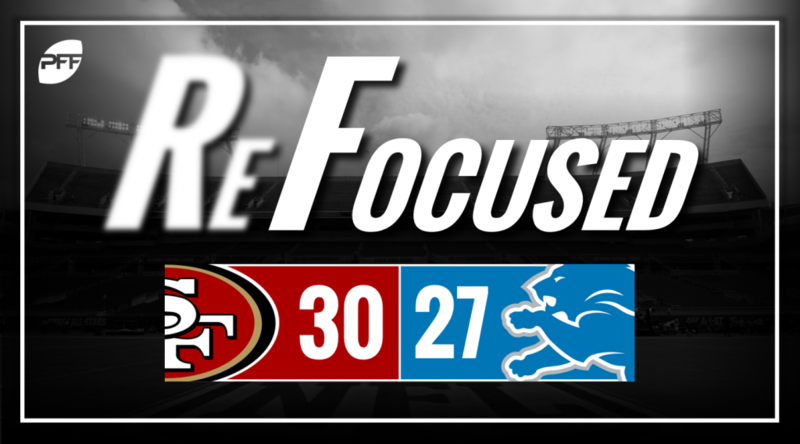 Detroit Lions: A couple missed opportunities in the passing game helped cause the Lions to come up short.